There is only one perpetrator of evil on the planet: human unconsciousness. That realization is true forgiveness. With forgiveness, your victim identity dissolves, and your true power emerges -- the power of Presence. Instead of blaming the darkness, you bring in the light. In a month whose main essence is to practice unconditional compassion and devotion to All, we are about to face a very powerful and healing New Moon at 26°53' degrees of Pisces. The New Moon in Pisces will be all about karmic clearing, and hence the subsequent healing that comes when we dissolve what was separated within. Pisces, rules intuition, compassion and devotion to service, with Pisces comes freedom, and the completion of a cycle, in both the micro and in the macro, as it is also happening in the Planet. With Pisces, the last sign of the zodiac endings come, as well as new beginnings for there is a moment in with both exist, at the same time, and it is from this timeless and spaceless moment, that we have the opportunity to create a new phase or to get attached to an old timeline. It is with Pisces that we begin to remember our true origins, clearing karmic patterns/debts, purifying ourselves and achieving personal enlightenment. This is where we find ourselves, at this time, between Piscean and Aries energies (we have Venus, Mercury and Uranus in Aries), between completion and creation, and it is in this blessed period that we have the opportunity to become neutral observers and become aware of what we must heal or to continue procrastinating that which at some point we will have to take responsibility for. It is during this magical as well as intense month that we are experiencing the separation between worlds with more intensity, one that began in December, when the bifurcation from old Earth occurred and that still continues. Some are yet resisting to leave more aspects of their old self behind, while others, are already embracing new ones from their God Self. All is happening according to a Divine Plan, and within it, who are we to judge? This New Moon in Pisces, will assist us in our healing/integration process for this Piscean Moon conjunct the Cosmic Healer, as I call Chiron, also in Pisces until next month that will enter into Aries. Chiron triggers profound healing and karmic release, which is something many are working with, at the moment. This is going to be a challenging time for those who are not aware of their deepest wounds, for when their unhealed pains come into the surface, this can appear in form of anger, sadness and/or even aggressiveness. As the ones who have already walked this path, know, confronting the shadow-self is not easy or a quick phase to pass. 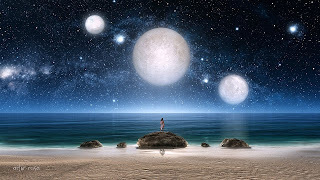 As the macro is a representation of the micro, we have a confirmation in our Heavens at the time of the New Moon of what many of us are already feeling/experiencing, for the New Moon will also square Mars, which is all about standing firm in our power, when we are challenged by others who desire to control us and exercise their egoic will upon us. For where there is anger, and lack of self-love and respect, there is the will to control, especially what loves us, unconditionally. However, as we are never left alone, within a loving Universe, we have two planetary alignments to bring settlement and harmony. One is an aspect to assist us dealing with any conflict we are experiencing, as Mars sextile Uranus, when the New Moon occurs, and this will bring balance and peace to all. The second one is the New Moon semi-sextile Uranus, which will bring clarity to find solutions, and insights to be innovative. As we end an old Planetary cycle, as this Piscean Moon reminds us, the 3D Planetary field as well as all the Planetary bodies, are shifting, for Earth, as you know, is a living organism in itself. During this transition, one that has been already achieved, although some are still navigating between both timelines, the Planetary field is unsteady, and this is causing confusion and chaos between many who are not yet able to fully embrace a higher state of being. This is a month that challenges us to have compassion for All - practicing the love we claim to be, at all times. For it is precisely when we are being touched by lower forces, that we are presented with the gift to stay center into our heart, and remain in our natural state of peace, independently of what is happening outside ourselves. March presents us with many opportunities for those who witness how their human selves behaves when one is attacked by many who are choosing to dwell in a different timeline, for it is in self-observation, and above all non-judgement, that we can realize what we are not able to envision, from a human and limited perspective, and that only arises when we face certain challenges. As you know, I shared many times about the battle between certain forces to regain control of Earth, it is more evident now for the souls who are able to see things from a wider perspective. This is a very especial Moon for those who are ready to heal their wounds for the Moon conjunct Chiron, which is often called in traditional astrology the Wounded Healer and as it is in Pisces as well as Neptune together with the Sun and Moon in Pisces, these frequencies, are going to provide us with the perfect opportunity for us to be benevolent with All, not just with the people and situations that are aligned with us, for in there lies no great mastering. The challenge to be the love that we say we are, comes when we face the opportunity to interact with the opposite polarity, for it is in this exchange that we can create alchemy and fusion instead of an egoic perspective of the situation. When we are literally attacked, I have shared about this many times before, first is necessary to be in neutral observation mode, with our own selves, for not all that have a different points of view is "dark". It is essential to understand once we have discerned about what is happening to us, with certain people and/or situations, that we cannot take anything personal for these souls are being manipulated by non-human and/or negative ET beings who are the real ones wanting to control, again, our Planet. It is important to understand what lies behind what we call "dark" ones. There are no soulless humans, for the human body to live it has to be infused with a certain amount of light. There are no bad or good people, simply some humans who have not embodied enough life force, from their I AM Presence, or as you prefer to call it, and hence, they are unconscious beings that will be governed by others, for their lack of soul essence will not allow more consciousness to be embodied. As conscious sovereign beings, our main task is not to judge, but to love and be compassionate with those who have a different journey. These beings that we call "dark", a term that the more we evolve the more we should cease using, for by using it we are still separating, are being targeted and used to act as conduits of confusion and chaos to manipulate consciousness. It is important that we understand that the same as some of us are bringers of love, peace and balance, on the opposite polarity there will be also bringers of chaos, unlove and discord. We live in a dual universe and both forces are meant to coexist in an eternal dance, for both are required for the other to exist. Revolting against one of these forces, is going against the nature of our Universe. Accepting and creating synthesis, is what empowered sovereign beings do. If we label what we consider coming from the opposite polarity dark, bad, etc, if we claim we come from the light and the others are simply mere beings attacking us, who know and are less than us, then we are still living in separation. Remember, All is of the Light, all is God, all was originated from the same Source of Love and Compassion. However, what we love is the aspect of them who belongs to the Divine, not the physical egoic aspect of them who are no longer dwelling in the Light. If when you/we are attacked, what we feel is compassion, love and gratitude for showing us our reaction to the situation, then we are finally embracing the challenge. When we stay, always, in the illumined Presence of our Soul, when we do not feel like wasting any second of our precious existence in what others choose to do or say, or not, then, we have finally become compassionate beings understanding where others are, choosing to only focus on the mission we brought here. When I share about a certain issue, is not because is being experienced just by me, this will be egoic, for it is not about me or my journey but about what we all are experiencing or happening in a deeper level. As I communed with my Unified Self, I was told this was an important subject, at this time, not just for me, but for the majority of the ascending souls. It is something that is necessary that we all experience, for in the end we all came here to remember the love that we are, in one way or another, the choice is always, within this free plane, ours. The journey from being unconscious to regain remembrance, again, of who we truly are, as you must well know, is long, challenging and confuse, and only love can help us regain clarity. To me, to be honest, as I always am, in my life the many "attacks" received, whether in the astral or physical ones, the people who my human egoic self thought that were hurting me, have become the most precious beings/teachers ever in my human experience, for they have made me the strong, free, sovereign and integrated being, that I am or at least try to be, now, although as you know, this is just the beginning of an endless path of conscious remembrance. Every time we face a challenge, it is an opportunity not to think how unconscious people is, but to observe ourselves, it is not about them but about us. For those who are experiencing attacks from the lower planes, in any form - human or non-human - attacks, these are some tools (I already assume as ascending souls you have done or are doing the work of polarity integration) so these are just some basics tools I do, everyday to stay center into my heart, and the love it holds for All. Protection - each morning and also before going to bed, I begin my protecting all my bodies, physical and non-physical, remember we dwell in many dimensions - 12D. Clearing tools - especially working with our mental and emotional bodies, clearing debris and any thought and feeling that is not aligned with our God Self. Commanding our sacred space - this is pivotal to avoid any undesired entity, and/or form of consciousness to enter into your sacred space. Many by not doing this literally allow others to enter into their sacred field and manipulate them or try to lower their frequency. Stay in a loving and compassionate space, knowing these beings are here to experience their own journey. You are not responsible for their journey and choices, only for your own journey and reaction. Your mission is to be the love you came here to be not to save anyone or interfere on their journey. I understand many of you will also feel guided or desire to call upon highly evolved beings. I call upon my Unified Self as my main protector, however, feel free to do what best resonates for you, and your unique path. As we keep approaching the Equinox on March 20, the influx received from our central Sun as well as from many other gateways and/or cosmic alignments, will increase tremendously, causing deep changes into our lightbodies or Merkaba, as other prefer to call it. As you already know, and to summarize, the lightbody is our energy field vehicle that is connected to our God Self, to where it comes back when we leave this human plane. To be able to reach this unified state, first the conscious activation of our lightbbody must take place. After the initial activations, there will be many taking place, if we have chosen to evolve, as the one that many of the ascending souls, are experiencing a this transitional time. As we are now dwelling within a new dimensional space, our lightbody must adapt to these new fifth dimensional frequencies that are we also integrating. Working consciously with our lightbody is essential to regain unity and our natural state of health, for any imbalances in it is manifested in our physical bodies in form of many diseases and/or pains. At this time, our lightbodies are being activated or recalibrated, for they are now adjusting to a new vibration. Our lightbody holds the entire knowledge of every incarnation and selves. So as we keep activating it, more memories, as well as soul gifts will be embodied, within our physical bodies. This is important when we are working in the unification of all of our selves - past/parallel, present and future - into this individualized aspect of us incarnated at this time on Earth. At this time our lightbody is adapting to the new planetary fabric. As a result there are many who may feel as if they need a time on their own, without much physical action, to utilize this phase to consciously assist their non-physical vehicle. At this phase, for some experiencing this inner transition, it may seem as it everything - our communication with the Illuminated Realms and/or personal Guides Team etc - may have literally closed, however, this is the natural adjustment that we need to pass through, until we prepare our human body to recognize this new frequency. At the moment, and one of the reasons why some people have this sense of profound polarization, a massive release is taking place, in the ascending souls as well as in the souls who are beginning to walk a conscious evolutionary path. The beings who are just awakening, will feel the deep impact of both polarities pulling to regain control, this is why some of them will react with anger, in pain or in many aggressive ways, until they master how to control these impulses as well as the unification of polarities, something we all, as humans, possess within. As our central Sun is also quite active, the heart opening will be challenging for those who are just beginning to reclaim their freedom. There could be many beginning on this path, or simply the ascending souls who need to work on their heart center. experiencing anxiety, pain, many challenging sensations in their nervous system, between many others, due to the impact that these conscious Solar waves are bringing for all who are ready to evolve. Dissolving old aspects of a self that has been familiar for us for so long, is not an easy process, this is why this month's frequencies of love and compassion, first with our own selves and later one with others, is what will help us overcome whatever we need to pass from being unconscious to a conscious state. For the ascending souls who have passed through all this first activations, you may find many changes happening, in the physical, as your lightbody keeps shifting and adapting to the dimensional space we now sojourn. The amplification that is coming with the Equinox is being strongly felt since a few weeks ago. There are many who work consciously with the Earth grids as well as other non-physical Earth fabrics, to assist in the transformational process that is occurring on Earth. As always, there will be more keepers of love frequency whose soul roles I do not name who feel guided to assist in this process, I cannot know or name all the infinite soul roles that exists, so whoever feel guided, it is always very much appreciated and needed, at a time when the both opposite forces collide to regain control of Earth as well as human consciousness. Consciousness' alchemists are the humans and non-humans beings who are assisting by bringing a fifth dimensional frequency which helps shifting the consciousness of the Planet as well as to use their gifts to alchemize consciousness, in all living organisms, not just in humans, they are connected to non-earth intelligence beings/form of consciousness and cosmic gateways that allow them to transmit this same higher frequency to Earth. This is a new term for me that I was told by my Unified Self, those whose main role will be to help in shifting consciousness, will know, the label does not matter but the essence, and intention, of what we do. For some people, especially the ones originated on Earth, whose consciousness are attached to eons of manipulation, and that want to liberate themselves from the soul matrix, will be especially challenging for obvious genetic, between many others, reasons. However, this is a unique time for those who are finally ready to confront their shadows and step into a free sovereign sate of being, for there was never more assistance in the Planet, as there are now. This amplification will come not just from our central Sun but from many galactic alignments, that due to the new harmonic space our Planet occupies now, is able to receive. Light is Infinite Intelligence, whatever it touches, enriches, however, as we are co-creating with this Light, it is also our conscious task to anchor it in the physical, for we all work in unison to anchor change. There are new openings on certain countries that allow now to anchor this new galactic wave, bringing purity to the land as well as to the Earth Grids that need restoration. Since I was invited by my Unified Self to share all I receive about Earth Grids to All, I have never felt the power of unity, in such a potent and beautiful way. Every single soul who unites in sending healing, is strongly felt for those who are connected to this mission, and for All in some other way, for all have our unique way to feel the effects of the assistance received. In my journey, which is as many of you already know, a solitary one, is what reminds me of our strength and the power of love, when many work as One. For it has showed me I was not as "alone", especially doing this mission, as I thought. Thanks, again, to everyone who feel guided to help restore what once was manipulated and destroyed, for in truth we came here as builders of the new, and also to everyone that has contacted me from many countries whose mission is related to it or simply who sends love. In every challenge, in every pain, remember, for we have already felt it, the power of unity. As always if the bifurcation from old Earth has been possible is because the fifth dimensional consciousness, so to say, for it is not about the number, have been anchored on Earth, however, if another 3D Earth still exists is due to the many countries that do not allow yet a higher frequency to be anchored, this is where we also should keep uniting as one and work, for we came here to assist precisely those who need of our love and help - not to remain in the ethereal - judging what is happening or not. Please, notice this is not about the beauty of the country but about the consciousness it holds, for as you know each country, as a collective, has a concrete essence and consciousness, this is what we work with, not with the country in itself, as some people have told me about certain countries having beautiful landscapes and so on, well this is not about this, for there is more, as for example nuclear activities, wars etc, that makes not possible to anchor a higher frequency, and we have to clean and heal it first before it can be done. These countries above mostly need healing and clearing so next we could pass to anchor a higher frequency. Thanks for your support, love, compassion and healing wherever you are in the world, for power knows no distances or boundaries, for it always dwell in possibility and selfless assistance to All. As ascending souls, we came here to serve by our Essence as well as by the unique tasks commissioned by Source/God, call it as you prefer. Our main aim should not just be shine our light, for even though this is essential, we can fall into passivity. Devotion to service means to be the LoveLight beings that we are and came here to be, yes, but especially in what we call "dark" "negative" and unwanted situations with undesired people, for this is where true compassion, love and strength resides. We cannot serve if we only choose to serve certain beings who are in resonance with our frequency, for they need no assistance, but of our conscious co-creation with them, which is totally different. Our devotion is not to a certain group or to ourselves but to All who need it. Sending our loving compassion, which most of the times means understanding, to everyone who is on their own journey, is vital, and in the moment we forget this, we lost our main mission. We never cease to learn and embody higher levels of consciousness, this journey is endless. If we cannot have compassion for those who are not yet where we are, then we have fallen into our egoic trap of separating what is not aligned with what we desire. Devotion means to love and care for all beings, to worship them, as equal. We are going to be challenged and as we live now as humans, we will have many feelings that are far away from love, we do not have to deny our human nature, but to embrace it and master it, to remember unconditional love. At this time, remembering the power of unity, unconditional love and compassion to All, is pivotal to assist those who are not remembering who they are, in the moment we understand all this but in practice we keep repeating the same old patterns - blaming others for being unconscious, and hence manifesting themselves in unconscious ways etc - we are the ones falling, like them, in narcissism - quite usual even within the spiritual community - and old patterns. It is easy to read, and agree that we shall be the love we are, practicing it, at all times, however, when we face unlove, in whatever form it comes, is not as easy as it seemed. This is where we are given the opportunity, by those beings we call unconscious, to show them a helping hand, if asked, for we should not interfere unless asked, bless them, and continue assisting whether we are appreciated or not. We did not come here to be appreciated, we already have all the love we need within, no external validation is required, we came here to be humble God messengers, and God only loves. God is never offended, hurt or disappointed, for God is All That Is, in love with All, the only ones creating this illusion of separation are us. We finally walked among the shadows for so long that we understand what residing in this frequency means. We are sovereign and free beings not because we are light, for all is Light, but because we know darkness and have confronted and embraced it. Our Light is not needed in the light, but in the darkness where it can shine, make a difference and be valued. The choise, is, always, us to make whether to keep assisting a few, of All, without any human conditions. As always, all choices are equally appreciated, and respected, within Creation. There is nothing we can do not to be. Note: I spent some time infusing this article with love, compassion and encoded it with light language. I always do this, but today I felt it was going to serve for those souls, we tend to call unconscious but that also need of our love and understanding.